Gentle natured Gregory, passed into eternity, aged 69, forgotten and alone in a cell of the women’s jail in Dade County, Miami. Married four times with six children he had once been a celebrity and successful paediatrician. But Gregory succumbed to alcoholism and his license to practice medicine was suspended. Haunted by self-doubt and unable to live in the shadow of his father, he had died known as Gloria in a women’s jail, in high heels, a transvestite. When he was just 19, Gregory’s father blamed him for his mother’s death from cancer and did not speak to him for ten years before killing himself in precisely the same way Gregory’s grandfather had done before him. In 1953, Gregory’s father wrote a short story about a Spanish father who tried to be reconciled to his son who had run away from home to Madrid. Now remorseful, the father took out an advert in a national newspaper “Paco meet me at Hotel Montana noon Tuesday, all is forgiven, Papa.” Paco is a common name in Spain, and when the father goes to the square he finds eight hundred young men names Paco waiting for their fathers. Gregory’s obituary appeared in the Times Newspaper because he was the youngest son of Ernest Hemingway. Ernest Hemmingway’s parents were regular churchgoers but detested their son’s amoral lifestyle. Eventually his mother refused to see him. One year, for his birthday, she mailed him a cake along with the gun his father had used to kill himself. Another year she wrote Ernest a letter explaining that a mother’s life was like a bank. “Every child that is born… enters the world with a large and prosperous bank account, seemingly inexhaustible.” The child, she continued, makes withdrawals but no deposits during the early years. Later, when the child grows up, it must replenish the supply he has drawn down. Hemingway’s mother then proceeded to spell out all the specific ways in which Ernest should be making “deposits to keep the account in good standing:” Things like flowers, fruit or sweets, a surreptitious paying of Mother’s bills, and above all a determination to “stop neglecting your duties to God and your Saviour, Jesus Christ.”[i] Hemingway never got over his hatred for his mother or her saviour. And it seems his own children paid dearly for the lack of love and grace he experienced from his parents. “Praise be to the God and Father of our Lord Jesus Christ, who has blessed us in the heavenly realms with every spiritual blessing in Christ. In the next five weeks leading up to Easter we are going to examine the five main purposes that God intends to be a driving force in your life. They are all found in Ephesians. You were formed for God’s family – to find a home and family; We have literally been adopted into his family. (Ephesians 1:5, 2:19-22). 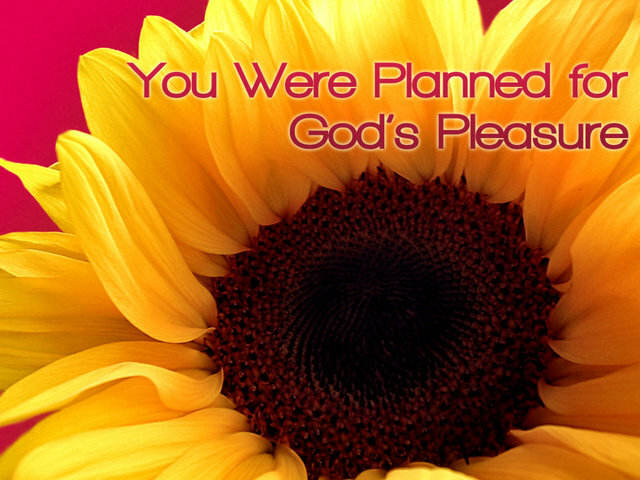 Today we begin with the first: You were planned for God’s pleasure. Please turn with me to Ephesians 2:1-10. In these verses Paul is speaking of God’s ultimate purpose for us – and it is summed up in one word – grace. In these verses, Paul describes our spiritual journey – before, during and after experiencing God’s grace. We are all mentioned somewhere in this passage. As we work our way through these verses, ask God to show you his Father heart for you. First we are reminded of our condition before we discover God’s purposes for us – without Jesus Christ. The clearest sign that a person is dead spiritually, is the way they treat other people. The events in the news this week provide us with ample evidence that the ruler of this world is at work among those who are disobedient. Lets not make any people group the scapegoat or think terrorism is somehow the cause of the conflict. The ruler of this world is just as active in the white racists attacking Muslims in Paris as he is in the Islamists attacking Christians in Nigeria. People reveal their disobedience toward God just as much by polite indifference to the Gospel as in religious extremism. In the eyes of God, both are hellish. Dead and disobedient. That doesn’t mean people are as bad as they could be, just not as good as they should be. The word “depraved” doesn’t mean a person only does evil or that they are incapable of doing good. It simply means we can’t earn our salvation, or meet God’s high standards of holiness. Dead, disobedient, depraved. “Like the rest, we were by nature objects of wrath.” Without Jesus we are objects of wrath. The court’s sentence has been passed, but God in his mercy has taken the punishment we deserve upon himself. You know what grieves me most about a funeral? It is not the death, it is the frequency with which we have to listen to Frank Sinatra’s, “I did it my way”. That is why without Jesus we are dead, disobedient, depraved, doomed – for this is our human condition. This is the reason we need God’s grace. “But because of his great love for us, God,…” Notice the way verse 4 changes the flow of the argument so abruptly. “But because…”. The emphasis is upon God’s initiative, God’s grace. His free, unmerited, unfathomable, incomprehensible, unconditional, undeserving – grace. Victor Hugo’s Les Miserables is a moving 1,500 page illustration of grace. Valjean, imprisoned for 19 long years for stealing bread to feed his family, longs to escape his past but the world does not readily accept ex-convicts and he faces rejection where ever he goes. On being burgled and beaten, the Bishop could have treated Valjean in one of three ways, just as God could treat you, and we do treat other people. First, he could have treated Valjean with justice. That is what his housekeeper wants. The Bishop could have given this criminal what he deserves; no more, no less. How often do we hear the cry for justice today? In this case the spoons would have been returned and Valjean imprisoned for the theft and grievous bodily harm. That is grace. Receiving a totally undeserved gift. No wonder Jean Valjean can only stutter out “Are you really letting me go?” And if you are not stunned by God’s grace at ‘really letting you go’ then you have neither really understood your plight, or the extent of his love. “Why? Why are you doing this?” We should cry out like Valjean. He cannot comprehend such undeserved love and generosity. And nor indeed can Madame Jillou. She could so easily represent the Pharisees of Jesus day and many religious people today. You can see from her face that she thinks it is a scandal. It is lunacy, that a guilty person should be treated in this way. “Why? Why are you doing this?” The Bishop replies, “Jean Valjean, my brother, you no longer belong to evil, with this silver I have bought your soul and now I am giving you back to God.” What is the effect of this grace? What is God’s purpose? The Christian is literally a new person. Born all over again. Like Valjean, we have been “made alive”, by God’s grace. The past is forgiven and forgotten. That is why the early church gave new names to people when they were baptised. They were new people. A new person. The very moment we surrender to Jesus we become children of God and we begin to live in his presence. Eternal life does not begin when we die, it begins when we trust in Christ. Physically we are still earth bound, limited by space and time, but spiritually we have already entered eternity, and have a new position with Christ. As children of God we have access to the Father. As his children we have immediate access 24 hours a day, seven days a week. We are now already with Christ. So keep your head up, you are a child of God. The words we say to the newly baptised are these. “We are children of the same heavenly father, we welcome you.” Lets practice it. We become a new person, we receive a new position. Our position with Christ gives us a whole new perspective on the world. Progressively we see the world in a different light. Now from His point of view. Behaviour we once thought was OK has to change because the Holy Spirit now indwells us. As we read the Bible, and as we listen and talk to our Father we learn to see things His way. This world is no longer our home. Heaven is our home. We have considered our need for grace. Without Jesus, we are dead, disobedient, depraved, doomed. The effects of grace. He makes us a new person, gives us a new position and a new perspective. Why? The Church on earth is a visible, living demonstration to the entire universe of the incomparable riches of God’s grace. We were planned for God’s pleasure. . How else can you explain a family made up of over 25 different nationalities and that is just in Virginia Water. We have here one of the clearest descriptions of how we come to faith. Notice that we are saved by grace, through faith, for good works. It is very, very important we get these in the right order. We are not saved by our good works, but for them, and even they have been prepared for us by God to fulfil. Do you know the good works that God has prepared in advance for you to undertake for him? That is why he has given each one of us talents and gifts to build his church and extend his kingdom. We each have a unique role to play in and through Christ Church. The Greek word for “workmanship” is poiema from which we get our English word “poem”. Coming to Christ is just the beginning. The beginning of a beautiful relationship of love and devotion and service of God within God’s family. The rest of Ephesians 2 goes on to describe how God has called us to be one in Christ. One family, one people, one church, the unique dwelling place of God on earth. amazing generosity of God’s gift of forgiveness to us through Christ’s death on the cross for us, paying for our sin, himself. At the heart of grace then is the fact that it is undeserved. I have done nothing to earn it. I can never deserve it. Faith is saying ‘thank you’ and receiving the gift that is offered. It is turning to God, as Valjean turned to the bishop. In utter weakness, in total dependence and receiving what we do not deserve. And like Valjean, it should leave us stunned, saying, ‘Are you really letting me go? Why, why are you doing this?’ Victor Hugo also wrote these words: ‘Life’s greatest happiness is to be convinced we are loved.’ In Les Miserables we see a picture of God’s purposes for us – utterly-undeserved forgiveness and generosity which Valjean receives from the bishop does indeed touch his soul at its deepest part. It unlocks his heart and unleashes his potential. What a picture of the Christian – Valjean is ransomed from fear and hatred and becomes a human being of remarkable generosity and mercy, touching numerous lives. He is transformed by grace and it all stems from the new identity and purpose he found when the bishop calls him ‘brother’ and ‘bought his soul and gave him back to God.’ Neither spiritual death, nor physical distance can separate us from His love, nor defeat the power of His grace. Living by grace is to find my identity, my ultimate worth as a human being, in the love of God, who knows exactly what I am like and yet loves me unconditionally. How can we not treat others with the same grace that God in Christ has shown us? How tragic that neither Gregory Hemingway nor his father Earnest appear to have found the grace they so desperately needed. Have you? Have you received the gift of God’s grace? Have you found the grace of God overwhelming? Before the creation of the world, you were planned for God’s pleasure. Have you realised you are more wicked than you ever imagined but more loved than you ever dreamed? Then respond today. There may not be a tomorrow. In Christ God is saying to you today “meet me… all is forgiven, Papa.” Lets Pray. [i]Philip Yancey, What’s so amazing about grace? pp. 37-38. This entry was posted in Sermons, Theology on February 22, 2015 by Stephen Sizer.